Summer is here, the mercury is on the rise and Perth is turning up the heat. Thanks to our friends at Youfoodz, we're bringing you this bumper list of the 50 Best Things To Do This Summer. While you’re off galavanting around town dying to tick off all 50, Youfoodz is freeing up a stack load of time, pre-preparing delicious, convenient and healthy meals—perfect for when it gets too hot to be outside and you need to just collapse on the couch with Netflix, the AC and great food. Get excited Perth peeps, this summer is gearing up to be the busiest one yet! Bucket lists at the ready, here are 50 things to do in Perth this summer. 1. Drink on the beach, legally, at Bathers Beach House. 2. Try Perth’s latest food trend, poke bowls. 3. Catch a flick at one of these outdoor cinemas in Perth. 4. Stock up on summer swimsuits. 5. Head over to Rotto and cycle around the island, reliving your favourite Ship to Shore memories. 6. Spend as much time dining at the beach as possible. Our pick would be Port Beach’s newbie, Coast; but there’s also Odyssea, Hamptons, Park & Vine, Tropico and Bib & Tucker. 7. Get your spritz on at one of these awesome venues. 8. Watch the sun go down at the South Beach Sunset Markets. 9. Eat fish and chips at the beach. We love Cott Beach and Amberjacks. 10. Go for a jog along Lizzie Quay and then eat all the calories you just burned at Isle of Voyage. 11. Take your pooch to one of these awesome Perth dog beaches. 12. Or head out on one of these secret walks and hikes. 13. Set out on a summer picnic at one of these spots. 14. Get a summer ‘do makeover at one of these awesome hairdressers. 15. 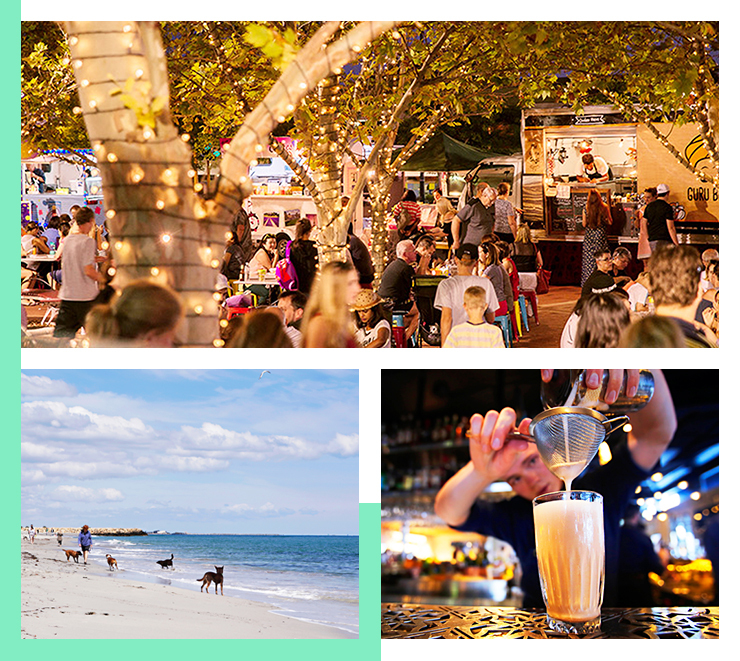 Pretend you’re a tourist for a day at the Fremantle Markets. 16. Go indoor skydiving at iFly Perth. 17. Cool down with one of these (non-alcoholic) summer drinks. 18. Visit the Hills for some fun among the shady gumtrees. Check out Mason & Bird, Jack & Jill and Lesmurdie Falls while you’re there. 19. See as many shows as you can handle at Perth’s Fringe World Festival. 20. Follow the food truck road to the Twilight Hawkers Markets. 21. Forget the outdoors, head indoors and cool off with the real Netflix and chill—Netflix and ice cream. 22. Get on your bike and cycle one of Perth’s best bike trails. 23. Take your drinks sky-high at one of Perth’s best rooftop bars. 24. Book tickets for Laneway Festival. 25. Check off all the items on Your Summer South West Bucket List. 26. Practice saying the word ‘brewery’ over a few beers at one of these cool spots. 27. Stock up on the best sunscreens, because skin cancer is not cool my friend. 28. Head to Sweetwater Rooftop Bar for the coolest Sunday sesh ever. 29. Trek down south and while you’re there head to Wise Winery’s new-ish spot, Lot 80. 30. While you’re down there, visit the Cape Leeuwin Lighthouse, it’s the most south-westerly point of Australia! 31. And maybe walk the cape to cape if you’ve got the energy. 32. Enjoy a pamper sesh at Limón Health and Beauty Spa. 33. Celebrate Chinese New Year at one of these spots. 34. Fill your calendar with events from PIAF. 35. Grab some snags and have a sunset barbecue at Kings Park. 36. Save your pennies and put yourself up for a night at COMO The Treasury. 37. Up your Perth foodie knowledge and set out on a Food Loose Tour. 38. Cool down at Australia’s first pop-up waterpark, Splash City. 39. Get downward at one of these awesome Perth yoga studios. 40. Jump on the stand-up paddle boarding bandwagon and buy yourself a board from Stand Up Surf Shop. 41. Find out how to survive a Perth heatwave, just in case! 42. Eat gelato from one of these places. 43. Get your body moving (preferably in A/C) at one of these new Perth fitness classes. 44. Try to grasp the rules of cricket at the WACA. 45. Take some time to chill out at Beyond Rest. 46. Make this raw salted caramel dessert, and send some our way! 47. Buy as many indoor plants as you can squeeze into your house. 48. Eat these buttermilk pancakes with slab bacon, caramel creme, honeycomb and viola, but not until you’ve taken a picture for Instagram! 49. Cool off while shopping for the latest and greatest homewares in Perth. 50. Bid adieu to the last day of summer by singing your heart out with Adele. Editor's note: This article is proudly sponsored by Youfoodz and endorsed by The Urban List. Thank you for supporting the sponsors who make The Urban List possible. Click here for more information on our editorial policy.